A daring cephalopod makes history. Famed for his many escapes, an octopus named Inky, “retired to the local aquarium,” performs one more to impress his friends. Slithering from his tank and past the other aquarium exhibits, he heads down a drain to the ocean. 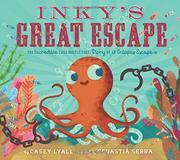 This fanciful story is based on a true octopus escape from a facility in New Zealand in 2016. Lyall anthropomorphizes her animals, giving her protagonist a propensity for storytelling and motivation for his great escape: a bet from his tank mate, Blotchy. Also, satisfyingly, though not accurately, she suggests that the escape artist occasionally returns to play cards and continue to regale his tank mate with his exploits. The text is set on digitally colored pencil-and-ink drawings, busy spreads showing a range of aquarium wildlife, depicted with large eyes and surprised expressions. There are also visitors and even a keeper, so distracted by the sound from his headphones he doesn’t see the fleeing fugitive. Sadly, the illustrator has perpetuated the cartoon misconception that an octopus has eyes on the top of the sac that is its body, rather than on the head that is the center of a cephalopod. Divya Srinivasan gets it right in a similarly anthropomorphic Octopus Alone (2013).